Today's mobile computing devices are getting lighter and smaller. While you are enjoying the portability and simplicity, you are sacrificing the connectivity. Connecting multiple peripheral devices such as mobile phone, mouse, keyboard, external hard drive, etc, is essential to high productivity. MakeTech's designers knew this and created this elegantly crafted product to let you claim the connectivity back. With a thickness of 0.35" and weighs just over an ounce, it can slip into any crevice without breaking an elbow. 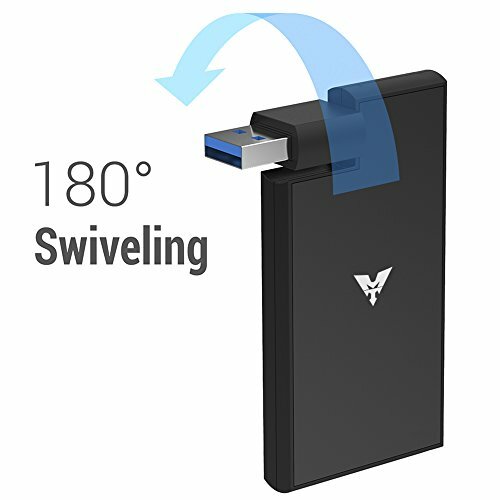 It provides 4 USB 3.0 ports so any USB devices can connect at the highest speed possible. Q: How fast is the data transfer? A: USB 3.0 is over 10 times faster than USB 2.0. It supports up to 5Gbps transfer rate. In real world speed, it can transfer a 90 minute DVD movie in 1 minute, 100 MP3 songs in 5 seconds. Q: How many devices can it support? A: You can connect up to 4 USB devices at the same time, with a maximum power load of 900mA. Q: Can it charge my devices? A: While it does have basic charging function, it does not have any external power source, so the maximum power load on all ports is a total of 900mA. Please check your device's power requirement. Windows XP/Vista/7/8/8.1/10, Mac OS 9.1 and above, or Linux. All MAKETECH products come with 18-MONTH product warranty & 30-DAY money back guarantee. With MAKETECH, you can rest assured that you are in good hands. Ultra Portable. At 0.33" thick and weighs just over an ounce, it is extremely portable. Simple and Stylish. Premium Aluminum Housing. A perfect match to your Microsoft Surface, Macbooks and Ultrabooks. Instant Expansion. Provides 4 USB 3.0 ports for your latest laptops & tablet PCs. Super Speed Data Transfer. Enjoys USB 3.0 data transfer up to 5Gbps. If you have any questions about this product by MAKETECH, contact us by completing and submitting the form below. If you are looking for a specif part number, please include it with your message.